This product has nothing to do with food, but it’s a stroke of ingenious frugal engineering, designed and developed in SA, that could greatly enhance the lives of billions of women and is thus worthy of exposure to all audiences! Introducing the iziWasha, an innovative low-cost manual clothes washing device for women in emerging markets that has just won a major global competition. The iziWasha has won the Africa-Asia final of the Global Social Venture Competition, the world’s biggest student competition for social projects. It is the first time an Africa team has progressed to the global final of this prestigious competition, which will be held next month in Berkeley, California. iziWasha is a handheld clothes washing device which is aimed at improving the lives of millions of women in low-income communities whilst saving water. Five billion of the world’s people do not have access to an automated washing machine. As a result, millions of women spend hours every week washing their families’ clothes by hand. 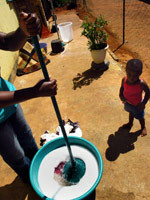 This chore is extremely time-consuming and can cause health complaints such as back ache and skin problems. iziWasha is a low-cost, patent, copyright and trademark-protected, manual clothes washing device which makes laundry quicker, less onerous and saves water. It requires neither running water nor electricity and is used with a simple bucket. The iziWasha team comprises GIBS alumni Rebecca Harrison and Lebogang Poonyane, who recently graduated with an MBA in Entrepreneurship from the Gordon Institute of Business (GIBS) in Jo’burg. Rebecca and Lebo beat teams from across the region, including from Asia’s top business schools, during the regional finals in Hyderabad, India, held in early March. For the global final at Haas Business School in Berkeley, Rebecca and Lebo will compete on behalf of GIBS, South Africa and the Africa-Asia region against teams from around the world, including from elite business schools such as Harvard, London Business School and Stanford University. Participants will compete for $45 000 in prizes, and will have the chance to showcase their venture to a seasoned panel of investors and specialists for the fast-growing social investment field. It is the first time an African team has reached the final. Previous participants include R-Motion Designs, whose low-cost lower limb prostheses for the developing world were featured by Time Magazine, CNN and BusinessWeek as a major innovation. iziWasha has already been endorsed by the United Nations through a 2010 SEED prize for sustainable entrepreneurship, and was the winner of the GIBS 2010 business case competition. iziWasha, which is manufactured in South Africa, uses 20% less water per wash than a traditional hand wash, up to 40% less than an automated machine, and no electricity. The product, which will be sold across Africa and Asia, has been rigorously tested in the South African market. In surveys, 100% of women surveyed chose iziWasha over the cash equivalent, and 2 000 units have already been sold. The team is in distribution talks with a major retailer, and has received interest from distributors in South Africa, India and from other African countries. The product is the first in the iziLife suite of products, which will improve the lives of women in the emerging world whilst making a positive environmental impact. Rebecca previously worked as a foreign correspondent and manager at international news organisation Reuters. She graduated with distinction from her GIBS MBA programme and was the top student in her class. Lebo is a former investment banker and experienced entrepreneur, who has started three businesses. Lebo was awarded a scholarship for the MBA course and also graduated earlier this month.